No one knows the name of 'the painter' who comes to the asylum in St Remy in the south of France, but they see his wild, red hair and news of his savaged ear soon circulates in the village and comes to the notice of the wife of the asylum's doctor. She feels herself drawn to him and learns that his presence is disturbing - and not just to her either. But back she goes - again and again. Until she is banned, but still she makes her way over the wall, through the garden to talk to this apparently mad and passionate man. 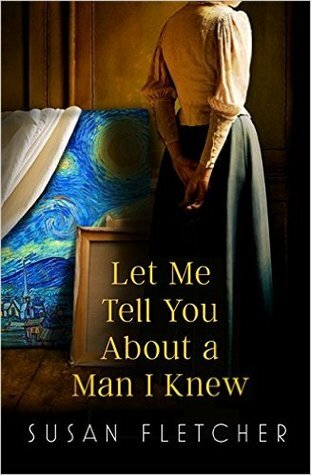 And the consequences of her indiscretion, of what van Gogh comes to mean to her, of what it will do to her marriage, her life once she has touched danger and passion will have far reaching effects - both surprisingly catastrophic and tender. As I write this commentary, only fourteen readers have rated Susan Fletcher’s Let Me Tell You About a Man I Knew on Goodreads. Seven have issued the book a flawless five stars, while another six have issued appreciative fours. Only one reader has gone lower and in all honesty, I’m quite comfortable being a lone dissenter. What works for one reader doesn’t always work for another and there’s nothing wrong with that so long as we can respect the subjective nature of reviews and the diverse opinions they represent. Getting back to the story at hand, I found Fletcher’s prose beautiful and thought her descriptions of the asylum of Saint Paul de Mausole in Provence strikingly original. I was familiar with Van Gogh before reading this piece, but this is the first time I’ve seen any part of his life fictionalized and I found a lot of merit in Fletcher’s characterization of the famed artist. That said, I struggled with the author’s tone and found it incredibly difficult to get lost in her narrative. Fletcher’s work is intensely introspective. The approach holds a lot of appeal for some readers, but my tastes are a little different. I liked Jeanne well-enough, but her marital problems and personal trials didn’t interest me. I found the development and pacing ponderous and often caught my mind wandering to more immersive fiction. There’s something to be said Fletcher’s themes, the oppressive loneliness of an empty marriage and the fragility of broken souls, but I favor more energetic fiction with overt movement and dramatic intrigue. In sum, Let Me Tell You About a Man I Knew was not my kind of book. I liked the story, but wasn’t inspired by it. The characters didn’t take up residence in my mind’s eye or capture my imagination. I appreciate the piece for its historic scope, but don’t think I’ll be recommending it to other readers very often. "More than yellow. Cadmium yellow. It’s in grass and dry earth, in mornings. I did sunflowers in Arles. This colour –" he speaks more softly now, as if confiding – "this is the colour of life to me. This, and the blue; I favour them together because there are some colours that bring out the brightness in another."